London Works serves residents and employers in western central Ohio and is located at 62 E. Second Street, London, OH 43140. Delivering the award winning Cincinnati Works model as a Columbus Works, Inc. satellite location, our mission is to impact lives through delivery of a transformational job readiness program, designed to remove barriers to successful sustained employment, empowering participants to move from poverty to self sufficiency. Violet Woodruff, Program Manager, Columbus Works, Inc.
Beth Gifford, Founder Columbus Works, Inc. Become an Employer Partner - There is absolutely no charge to Employers Partners to hire London Works Members. Contact Violet Woodruff, Program Manager, at vwoodruff@thehrdg.com and enjoy the benefits of a London Works partnership. 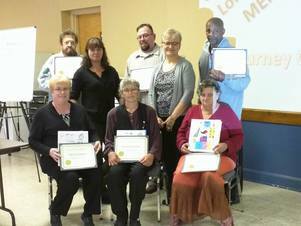 Instructor Debra Wright and Program Manager Violet Woodruff congratulate new Members for completing the 5-day job readiness program. London Works, Inc. is a non-profit Ohio Corporation with 501(c)(3) status. All contributions are tax deductible. For information on how you, your company or organization can financially partner with London Works, Inc., contact Program Manager Violet Woodruff at vwoddruff@thehrdg.com.